We got an email from Joachim, a Physics teacher and a reader of MyNokiaBlog. He’s a Nokia N9 user and has sent us an article in how the N9 with all its sensors can be useful when teaching physics. If Einstein were alive today, I think he’d be most impressed by the Nokia N9, no? At the beginning of a lecture in optics I like to demonstrate the white balance settings of the camera in my smartphone. For this purpose I connect my N9 via the tv out with a beamer and demonstrate how the color temperature of photographs changes with different settings. In this way I bring home to my pupils that any visible object emits light. The light emitted by an object depends upon the light that itselves receives from another light source. This explains for instance the different shades of colour in neon or candle light. In this way you can demonstrate nicely that colours are no objective property of an object, but always depend upon the light in which an object is being seen. Modern smart phones have sensors for acceleration. Telephones need those sensors to gauge whether the device is being held horizontally or vertically. For the N9 there exists the app seismograph which represents the acceleration graphically. This presentation is not very accurate, you get no absolute value of the measurement, but for simple movements of your hand you can make approximate diagrams of acceleration in time. If you let the device fall softly on a table you see that this push is equal to a strong acceleration. 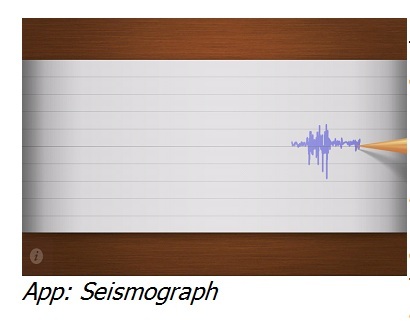 The seismograph can, like all apps, be shown on a beamer. Often you want to mark in the teaching of phyics equal time periods (e. g. for oscillations, for the making of time-way-diagrams…). 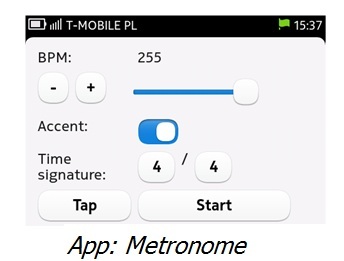 With a metronome app different time periods can be indicated acoustically by beats. The stroboscope is also interesting for the presentation of movements. 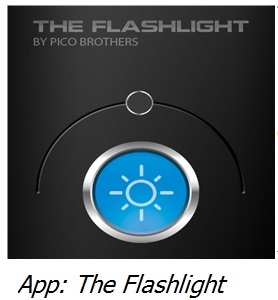 The stroboscope-app “The Flashlight” switches the LEDs of the N9 on and off. With a stroboscope you can visualize in dark surroundings snapshots of moving objects. The frequency can be changed. al noise level on a screen. In this case you also have to take into account that this measurement is not very accurate. In addition, the app is not shown in the landscape mode, but this disadvantage is only small. A teacher often wants to show his pupils experiments and is faced with the problem that not everyone can see the experimental set-up. If you want to avoid crowding around the table, you can connect the N9 to a beamer and transmit the experiment live. Most pupils will only be too glad to shoot the happening with the N9. Time-distance diagrams can be drawn quickly with the smartphone. Unfortunately, the player in N9 functions only in intervals of one second. It also is very taxing to hit the beginning of a second. Nevertheless the movement of a slow toy car can easily be registered. Ideally, the corridor of the class-room is tiled, so that the measurement of the distance can be made easily. To present the apps really on a screen you need the correct kind of cable. I use the CA-74U cable that I bought originally for my C7. It functions without any problems with the N9. Since nearly all monitors, beamers etc. 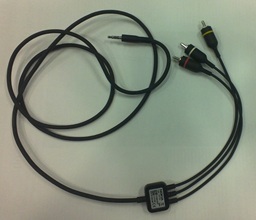 have a video connection, this cable is ideally suited for teaching purposes, since schools are, as we all know, not very well equipped technologically.